Most of my books are now available as electronic books both on Kindle and other eBook formats. The links on this site are currently to the Kindle editions on Amazon. You can find other formats at Waterstones and other booksellers. 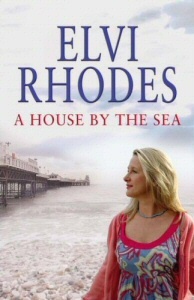 My latest book, A House by the Sea, was published in March 2008. A Blessing in Disguise, which was published in 2003, seemed to go down well with my readers. I have always had feedback from my you, but in this case I had more letters, passed-on messages, e-mails than I'd had in the early days of any of my books. Perhaps readers get in touch with authors once they feel they know them through their work? I do really enjoy hearing from you, either through my publisher or by e-mail. Also, you tell me what you would liked best and what you would like next - and in this case it was a sequel to A Blessing in Disguise, which was requested by a surprising number of you. 'I want to know what happens to Venus' you said. So - I have written the sequel, Mixed Blessings. I, too, wanted to find out what happens to Venus, and to everyone else in the village of Thurston. She has given me a few surprises! I hope she will do the same for you.